Wedding PR: Special Events, Brides.com, Hill City Bride, and More! Happy Monday! This week brings another great batch of client features, including Special Events, Brides.com, Hill City Bride, and so much more. Keep scrolling below to check it all out! 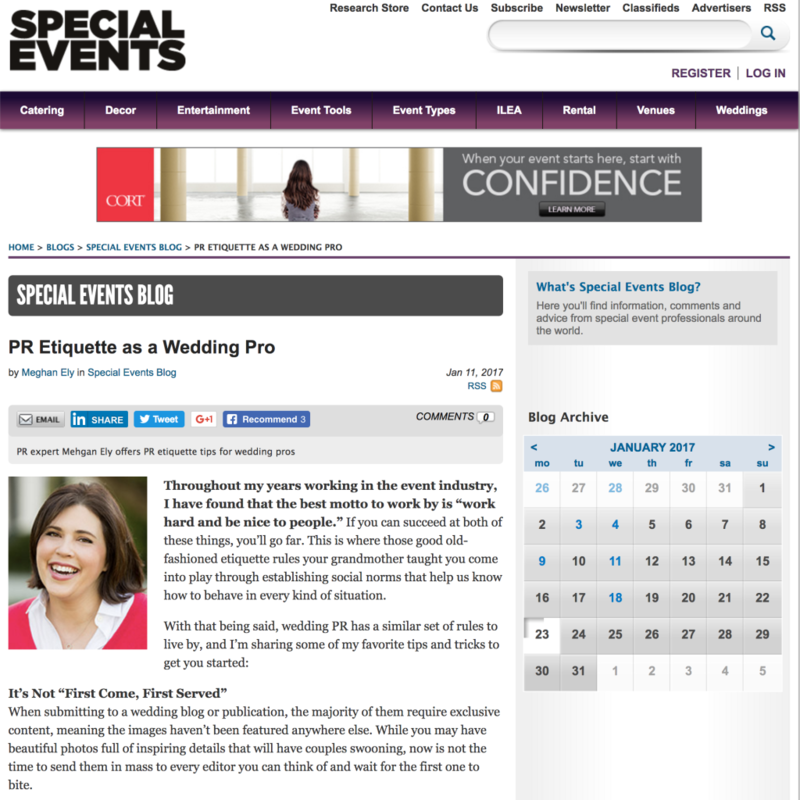 OFD Guest Blog was featured on Special Events with their article, PR Etiquette as a Wedding Pro. See the full article here. LadyMarry and Mike B Photography were featured on Brides with their feature, The Top 7 Mistakes Couples Make When it Comes to Their Wedding Day Timeline. See the full feature here. Stephanie Yonce Photography was featured on Hill City Bride with their feature, Elegant Richmond Wedding–Nathan and Rachel. See the full feature here. Taylor’d Events, Passport to Joy, and Belladeux Event Design were featured on AllSeated with their feature, Hardest Parts of Wedding Planning: What You Didn’t See Coming. See the full article here. Taylor’d Events Group was featured on WeddingWire EDU with their article, I Run the Company: What Does That Look Like? See the full article here. Belladeux Event Design was featured on Catersource with their article, Outdoor vs Indoor Venues–What’s the Difference? See the full article here. OFD Consulting LLC and Cocoon Events Management Group was featured on Apartment Therapy with their feature, In Retrospect: Here’s What 5 Couples Really Wish They Had Registered For. See the full feature here. 100 Candles were featured on Classic Bride with their feature, Aisle Society Experience: Elegance Romance Vignette. See the full feature here.